Many people claim breakfast is the most important meal of the day. You are warming up your inner motor and giving it plenty of fuel to run. If you agree with this, you may be looking for some variety in the daily starting meal. Why not come to PANCAKES Amsterdam, for the best breakfast ever? At PANCAKES Amsterdam you can find several different kinds of breakfasts. Break away from the continental breakfast in your hotel and enjoy a real English, French or Dutch breakfast. Or… a pancake breakfast! Yes! How about that to start a day…? Before we indulge in the pancakes, we give you just a short inventory of the different nationalities breakfast: a French breakfast consists of croissants (of course), the English variety has bacon and (scrambled) eggs, and the Dutch breakfast comes with ham and cheese for your bread. Pancake breakfast: Dutch or American? The pancake breakfast has two possibilities: the Dutch pancakes, for which we are so famous, or the good old American pancakes with a Dutch twist. After all, you don’t want to think you are back home when you are in Amsterdam, do you? A special pancake breakfast menu with orange juice and coffee or tea is served till 1.00 pm. 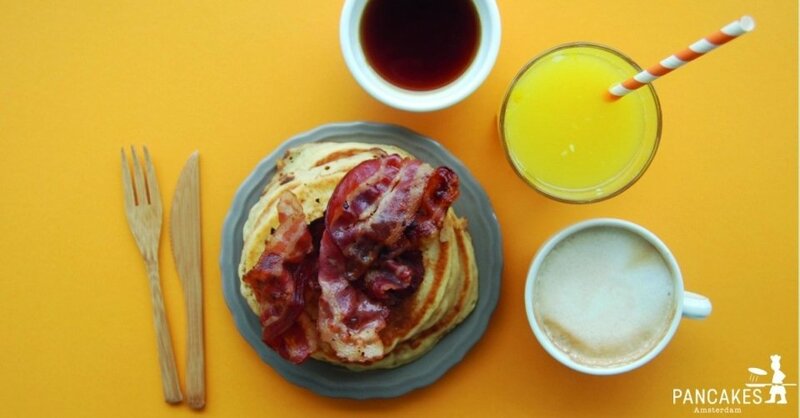 American pancakes with bacon and maple syrup, an orange juice and a delicous black coffee! For the young visitors of Amsterdam, PANCAKES Amsterdam has a KIDS pancake: a traditional Dutch pancake with strawberry jam, raisin, chocolate sprinkles and fresh fruit. You possibly won’t get your kids out of the restaurant after that; they will love to stay for lunch! The American pancakes are dressed with Dutch varieties you won’t find that often back in the States. That is just what we are after! PANCAKES Amsterdam is an Amsterdam experience, so no American varieties here… Just look at the menu on our website to see what we mean. The list of savory pancakes is just too long to put in here… We suggest you browse our menu under Dutch pancakes to get yourself all indecisive – so much to choose from! And if you are going to PANCAKES Amsterdam Westermarkt (one of the three locations where you can find us), you can even decide to go for those typically Dutch “poffertjes”, a kind of mini pancakes, steaming hot and finger licking good! As a specialty PANCAKES Amsterdam also features a Pancake of the Month, bringing savory tastes from all over the world to your pancake. For instance, recently we had Italy and Germany. And there is also the possibility to pimp your pancake yourself. Either you start from scratch and load some toppings on your pancake, or you take one of the menus and add one or more toppings. Enjoying your breakfast at PANCAKES Amsterdam is a treat in itself. The Dutch don’t typically eat pancakes for breakfast, but that doesn’t mean you can’t, does it? Unless you want to do like the Dutch do while being in the Netherlands: then you treat yourself to a Dutch breakfast. And you save the pancakes for lunch or dinner; you will be so completely Dutch, then! Pancake breakfasts may give you a whole new look on Amsterdam. With a well-filled tummy, your experiences are so much clearer, and your enthusiasm to undertake a walk through the heart of this beautiful city will rise immediately. After all, your body is well prepared for such an undertaking.